Note: I shared these ideas and stories around The Iceberg of Life from my own life — successes AND struggles — at PressNomics 4 in March 2016 and then again in December 2016 at WordCamp US. And now I’m finally getting to share it more broadly. Thinking about life and business like this has been incredibly impactful for me and it seemed to resonate with those I shared it with at PN4. And full disclosure: I am not a professional or licensed counselor, just sharing my experiences in the hopes that they/this might help you. Comments, ideas, suggestions and of course stories are welcome in the comments below or to me personally. Here goes! 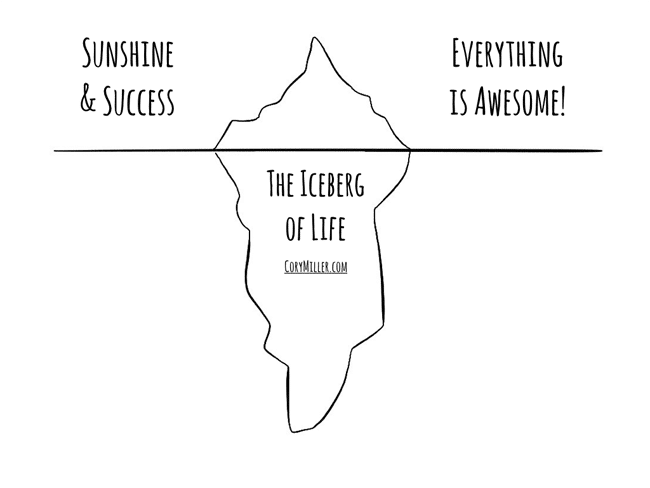 So much of life (and being an entrepreneur in particular) can be explained with the example of the simple iceberg. On top of the surface are the things that everyone sees … or more importantly, what you WANT everyone to see. It’s all the successes. The wins. The highs of life. The hoorays. It’s the LEGO movie theme song: “Everything is AWESOME!” The really, really good stuff of life you readily share and are excited about. But for so many of us, it’s also the Press Release version of what’s really happening as that’s the only thing most people see or know about. 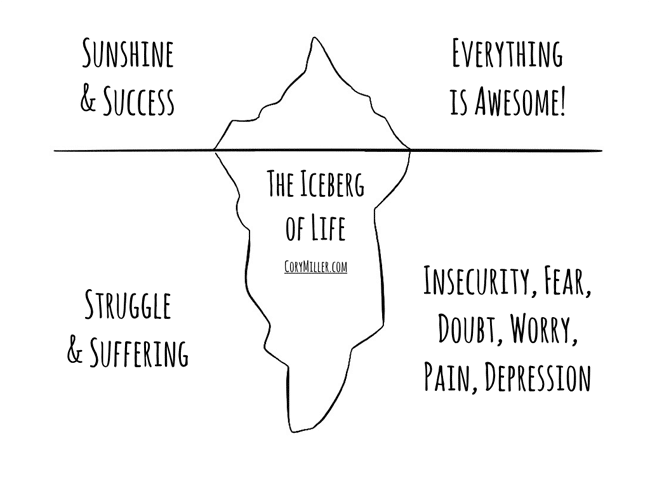 But I think this image of the iceberg paints a more accurate and full picture of what many of our lives look like, from time to time. And from my personal experience, it is all the things that affect everyday life, even if you don’t realize it, whether it’s traumatic childhood experiences, chronic pain, self-doubt and worry, to relationship problems. And then for some of us, it’s life week to week, day to day, or moment by moment. The Below the Surface stuff that’s buried down deep, in the dark. The stuff we hide. That we obfuscate. That we share with few people or no one at all. And the deeper you go, the darker it gets. And thus, at the very bottom of the iceberg could be suffering and depression. For many people today, depression is an ongoing battle. 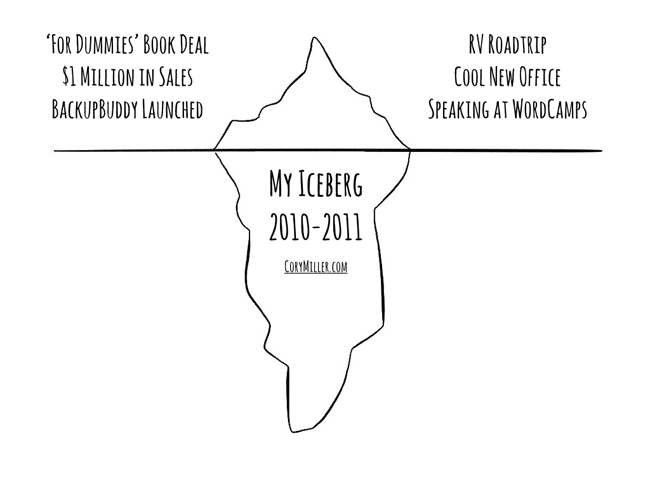 In the essence of sharing, and to show you’re not alone, I’ll share a couple of details from my life in 2010-2011. Here’s what the Above the Surface looked like and many people saw during that time. I lived a lifelong dream by co-authoring my first commercially published book from one of my favorite book brands — Wiley’s For Dummies series. We also launched our hit product — BackupBuddy — which continues to be the cornerstone of our business. And our little fledgling startup hit $1 Million in revenue as an important milestone in the life of it. I rarely if ever talk about numbers, but this was a neat metric, what I refer to as our high score in the video game I call iThemes, and something we celebrated. What I am reminded by sharing these things are how good I’ve become at making the Above the Stuff stuff look so good, while Below the Surface I’m filled with hurt and doubt. I’m really good at the Success part … but realized I need help with the Struggling part. 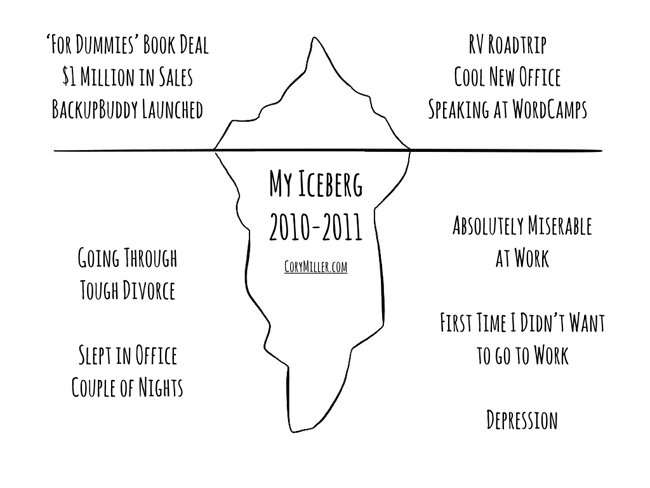 Because the reality of my life at the time was this is what my Iceberg fully looked like. But below the surface, I was miserable and at different points was at the lowest points of my life. Personally, I was going through a tough divorce, with deep relational and financial consequences. And professionally, I was miserable in my work for a number of reasons I won’t get into here. I’ve talked at length in this post titled Everybody Hurts and It’s OK to Ask for Help, as well as spoken publicly on it numerous times since the summer of 2015. It’s become a huge part of my mission and purpose of life — to share my stories in order to help others seek and get help, and to erase the stigma of mental health in the world. And this is just one small facet of my Iceberg during one period of time in my life. Today, my Iceberg looks difference, but there are still things lurking under the surface (I just deal with them differently). Since that pivotal time in my life, I’ve learned the value of an inner circle support team, and worked hard to build that layer of accountability, support and love around me. These are the people who help me most with my Iceberg. The kind who when others run out of your life, they in turn will run into yours to provide love, care and support. Whether it’s just a listening ear, a shoulder to cry on, or someone to help guide your path when you’re in the deep and scary dark. My wife, Lindsey. She’s my first and primary partner in all of life, and my most important relationship. Without her ongoing support and love, I couldn’t do what I do every day. And she’s a cornerstone of my happiness. My mentor, Smitty aka Michael Smith. Along with my business partners, Scott and Jay, he is the type of man and entrepreneur I am seeking to be. He’s been there, done it. He is older, more mature, and more experienced than me. Our values and approach to life and business are very much aligned. I admire him greatly and seek his counsel often. My counselor, Kyle. I’ve been seeing Kyle since 2010. He’s a licensed, experienced counselor who I deeply respect. My wife and I now put reminders on our calendar each quarter to make an appointment, and then separately in-between our scheduled times we book appointments with him to work through our Below the Surface stuff. Like-Minded Entrepreneurs. Since 2011, I’ve been meeting with my forum group of Entrepreneurs’ Organization Oklahoma chapter every month, for three hours. In that time, I’ve gotten married, had two kids and our business and my happiness has increased greatly because of this group of entrepreneurs walking together. There are also a lot of other entrepreneurs I put in this category who aren’t part of EO, and cherish those relationships. I value these relationships so much because I know that through the ups and downs of life and entrepreneurship, I have people who love, care and support me and I can turn to when I need them. They make the difference for me, and why they are my All-Star Support Team. So now, I have a challenge for you. One I would have put to myself a long time ago and saved myself some heartache and hurt and loneliness. The challenge and battle is to not suffer silently. Or alone. To seek and get help when you don’t need it, so you have it when you do need it. To build a support team around you. So don’t try it alone. To nudge you in that direction, I have some homework for you that I’ve found extremely helpful for me. Just a simple exercise to think about your Iceberg. 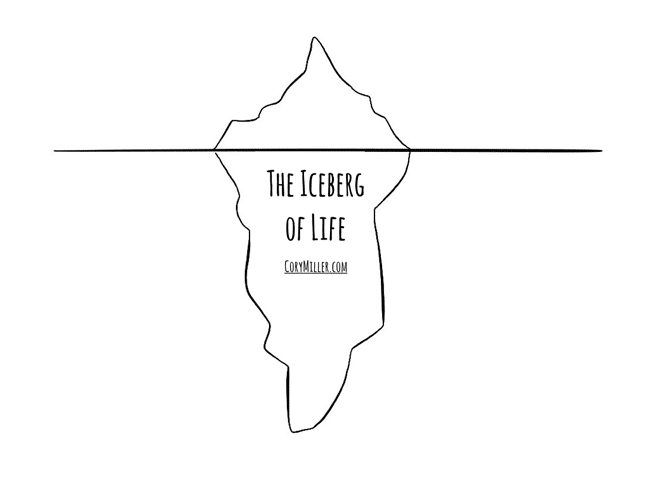 First, print out the PDF in this post or take a piece of paper and draw an simple iceberg. Next, start thinking on and listing out your Below the Surface issues, challenges and problems. What’s keeping you up at night? What’s causing you heartburn? What’s causing you the most pain and suffering? Then third, list out 3 things you’re most grateful for today. Researchers and experts say that gratitude is a huge antidote to the blues and a key to happiness. So often, when I’m dealing with something deep down and hurtful and suffering through it, I try to take a step back and say, “OK, what am I thankful for?” Take just 5 minutes to think and write about those things and then another 5 minutes to dwell on and savor them. OK, so that’s my perspective and insights on the Iceberg of life, the simple things, and more importantly the key people who help me so much to deal with the iceberg of life. 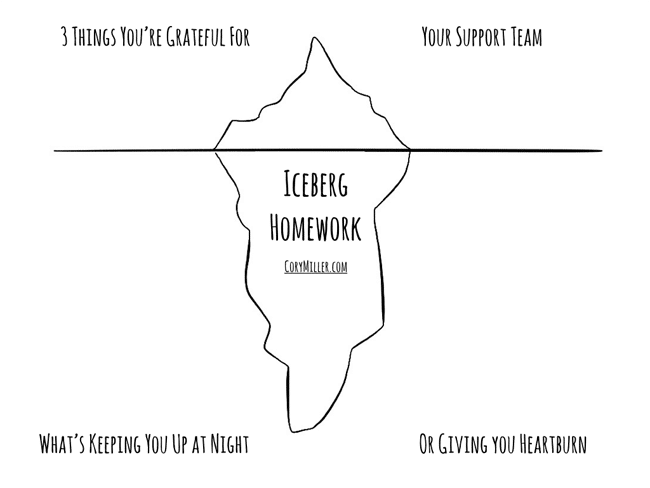 I hope you’ll set aside some time to work on your Iceberg today, this week, and regularly, for your own health and happiness. And again, share your thoughts and stories in the comments below, or with me privately.